Since my woodworking shop is in the bottom floor of my house, my kids spend a lot of time in there with me. They both have a set of ear muffs and a few tools. My daughter “sets up shop” on the big flat table saw bench (blade retracted, don’t worry). She might sand or saw things with me for a bit, then she brings down blankets, pillows, books, art supplies, and snacks. She plays make believe games, calling her friends on the “phone” and inviting them over to have tea. My son likes to work on projects at the work bench. Underneath my chop saw, there is a big tote bin with the cut offs from various pieces of wood. 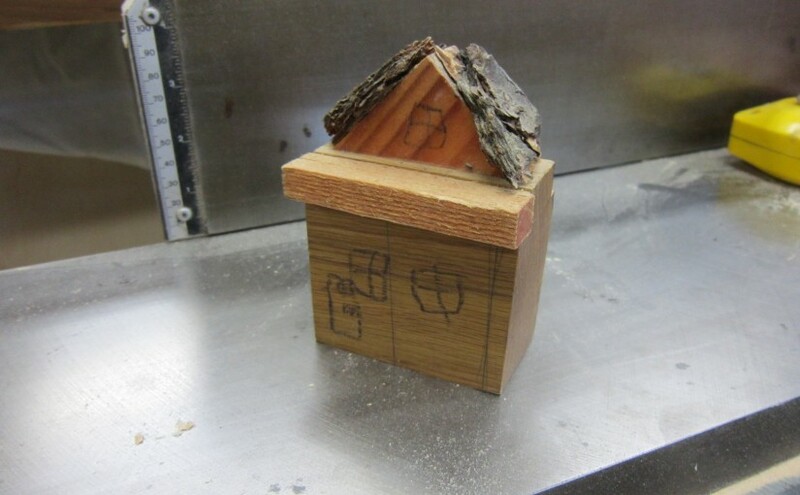 He sorts through them and finds ones that are interesting, then makes wood art – like the one you can see in the photo. (This process was inspired a few years ago by his one of his art teachers Nancylee Smith). The project you see is a house that he built himself. He also sweeps up the saw dust on my shop floor for a loonie (he’s saving up for a mountain bike). Pretty soon he’ll be planing timbers with me! I love seeing his initiative and his creativity. And I love having both him and his sister hang out in my shop with me! Last winter I designed and built a custom plant stand for a customer in Calgary, Alberta. The request was for a piece of furniture inspired by a Japanese garden gate that could hold a number of plants and be a decorative addition to their living room. I was excited to take on the challenge of creating a unique piece that would be both eye pleasing and functional. The end supports are made of circles, each cut from four pieces of wood glued together. And to add another element of interest, the shelves are cut as horizontal arcs that are offset at each level of the stand. 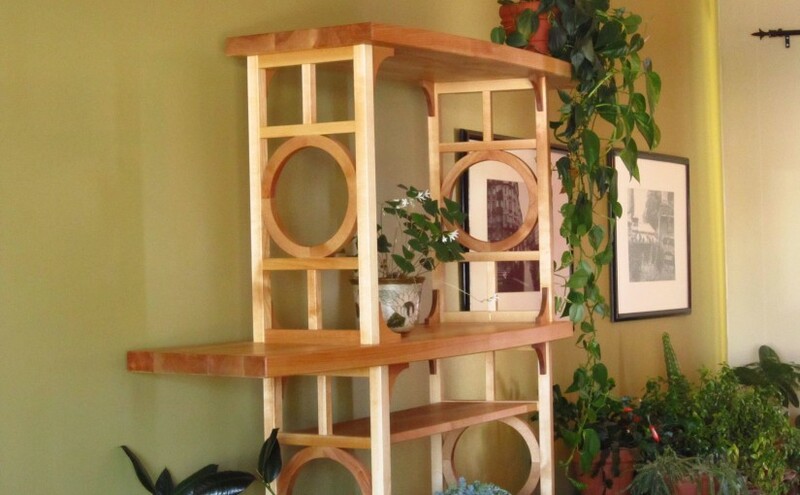 Originally designed it without the corner braces, but the shelves were not stable enough to hold the weight of the plants. The frame was racking from side to side, and I had to adjust the design to add small corner braces at each level. The customer was super happy with the finished piece, and she was able to display her plants – out of reach of her new puppy!